In 2008, the problem struck core as Countywide, American largest mortgage issuing bank plunged into the single digits on the rumors of impending bankruptcy. The Countywide saga then ended last week with an orchestrated buyout by Bank of America. In response to the damage, global central banks have lowered interest rates and willingly lent (printed) approximately $1 trillion dollars to banks and institutions while taking questionable debt assets as collateral at face value. Even with such drastic measures deployed, worry and uncertainty still linger. So where do we stand now in 2008? 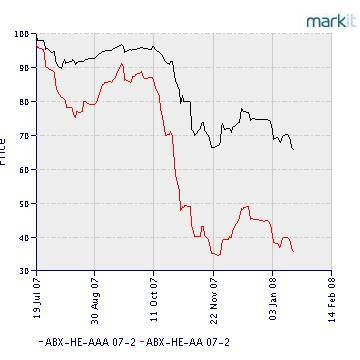 According to the ABX index at Markit.com, AAA mortgages are selling at 70 cents on the dollar and look to go down further. This means that on every mortgage Freddie Mac and Fannie Mae guarantee, they are losing 30 cents on the dollar right away. Given that the mortgage exposure of Fannie and Freddie are in the hundreds of $billions, we look for Freddie to announce insolvency unless bailed out by the government. Subprime debts are changing hands at less than 20 cents on the dollar. The entire subprime market, a key driver of the US economy and money creation, is over. Given there is upwards of $2 trillion of subprime debts, which are selling at 20 cents on the dollar, we will see a lot more subprime write downs to come not just from banks, but pension funds and endowments throughout 2008. Mr. Bernanke lied when he assessed the damage of subprime at $200 billion in November 2007. As illustrated in the following official chart published by the Federal Reserve, Asset Backed Securities (yellow line) have lost 40% of their value to $750 billion from over $1.2 trillion. While the 40% officially claimed loss is not as bad as the 30% - 80% loss (depending on grade) estimated by Markit.com, the estimate nonetheless is stunning and shocking. Last year we speculated that credit card backed asset securities would be the next victim. 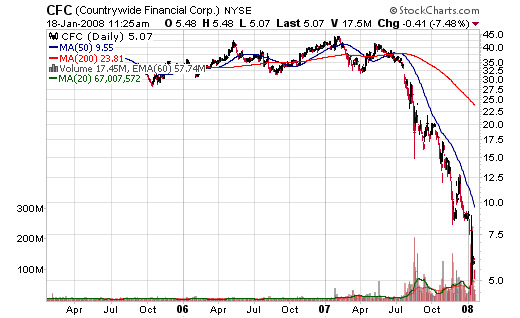 The following chart of Capital One, America's top credit card issuer, confirms our belief. The company announced mounting payment delinquencies and failed to deliver target earnings. We anticipate much further room to fall for COF, and most credit card issuers to come under pressure. Credit card debts/backed securities are a multi trillion dollar market. The fall out from this market will make headlines no less spectacular than ones created by subprime. 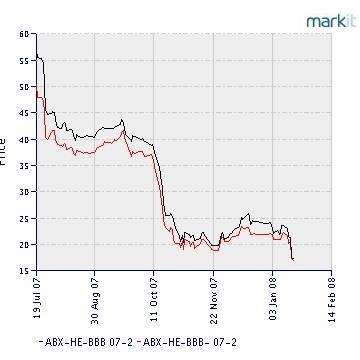 S&P Moody's downgrade of ABK's credit rating would mean the disappearing of the fee spread and the end of chapter for the company. What does this mean for 2008? The US debt binge is over. Foreign investors will increasingly shun US debt assets backed by mortgages, credit cards, car loans, and third party guarantees such as Ambac. This will create downward pressure for the dollar. Both the US economy and money supply growth will slow. The economy grows in dollar terms by the increase of dollar aggregates. Dollars are created and supplied through borrowing. If banks can't sell/flip those loans and mortgages they originated, they are likely to create a lot fewer loans and mortgages. US consumers are tapped out. Regardless of interest rates, frivolous lending of credits cards and home loans has come to an end through tightening lending practices. This will slow down consumer spending. Interest rates will remain tame. Can't raise them or it will crash trillions of already distressed debts, can't lower them much more with oil already at $100. Unlike debts which are strictly paper instruments; equities tend to survive through financial turmoil in the long run as they are quasi-tangible assets. Equity markets won't crash but will be volatile. With vastly diversified multinational listings, there is already a decoupling effect between the US economy and US stock market. As the charts illustrated below, the rate of money creation has slowed down (in red), and this will create volatilities in the US markets. Increase deficit spending and tax cuts. Indiscriminately lend to banks at any rate to keep them from failing. This is an extremely bullish scenario for gold, not because the pace of money supply growth is increasing (in fact quite the opposite is occurring), but because of the irreparable damage to integrity of, and confidence in, the financial system through each bail out. Technically gold has just overcome the all time high of $850 set in 1980, we see a brief pause here before challenging $1,000 this year. We recently concluded exhibitng at the world's largest resource investment confernce in Vancouver. I participated in a panel and conducted a workshop. The write up can be found here .